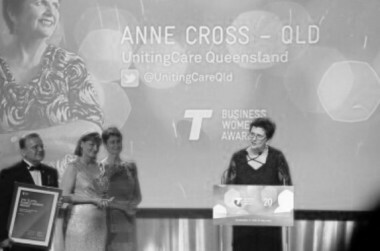 Interview with Anne Cross UnitingCare QLD CEO. “At 16 I thought you could change the world, I actually went off to uni and studied science. Whilst I was there I started to meet people who were working in other areas so I swapped into social sciences. I did social work and started life as a frontline social worker.” Anne Cross. 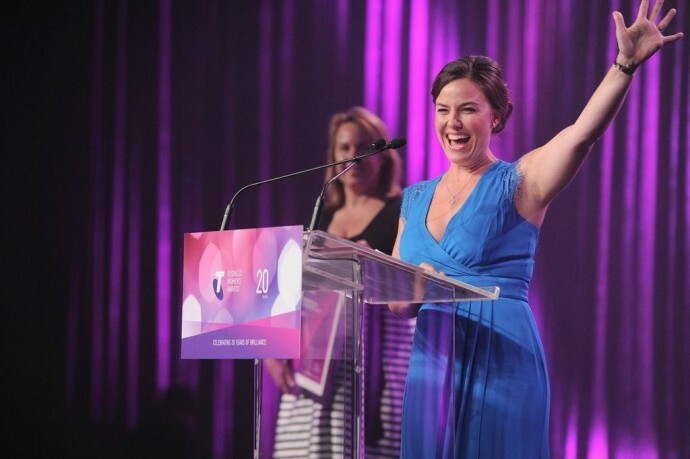 You know what happens after you attend the Telstra Australia Business Women’s Awards? You wake up infused with the belief anything is possible. Last night I was lucky to be in the room with some of the nation’s brightest business lights, I listened to their wisdom and watched as Queensland’s not-for-profit CEO Anne Cross took out the top honour. As Chief Executive Officer and Board Member of UnitingCare Queensland she employs more than 16,000 people, has more than 9,000 volunteers and a turnover of $1.2 billion. “Hopefully this award will highlight our role and importance in society,” she told the audience. Now it’s your turn to hear from these incredible gals. Martine Harte: Anne what do you regard as the greatest learning you have received in your role? Anne Cross: Really about how much more you can do if you get the right people around you and get that team working well. If you’ve got a team of fantastic people you can move mountains. Was there a situation where you almost felt derailed because you didn’t do that? Anne Cross: Oh yes! Absolutely, I’ve certainly been in roles where I might have had a mandate for creating change and people haven’t wanted to go on that journey with me. So yes, I have felt kind of derailed and undermined and all of those things I’m sure all of us have had happen at different points of our career. What do you consider the biggest threat to business success and how do you handle it? Anne Cross: Not actually looking over the horizon and reading the signs of what’s coming. I work in health and aged care and other community services, disability. Mammoth changes coming in every area I work, if we weren’t looking over the horizon we could easily be derailed. My advice is: stay grounded in what you’re doing now, absolutely understand the stories of your work now, what your staff are doing, what it means to be a patient in hospital, what it means to be an older person having to go into residential care. Keep scanning the environment and bring in people who can help you read the future. Where did you passion for the not-for-profit sector come from? Anne Cross: At 16 I thought you could change the world, I actually went off to uni and studied science. Whilst I was there I started to meet people who were working in other areas so I swapped into social sciences. I did social work and started life as a frontline social worker. I saw the best and worst of humanity and that gave me a passion to make sure we maximise the best and minimise the worst of what can happen to people. These days I’ve also got a mum with dementia, so I now have first hand experience of what it means to grow old, how I can help her maintain her independence and maximise her dignity. So these things are important to me, always have been and they keep me going. I see our staff do amazing things all the time. Extraordinary people doing great things for others every day, it keeps me very inspired. What do you plan to with this platform the award has given you? THIS IS WHAT THE NATION’S YOUNG BUSINESS AWARD WINNER LOOKS LIKE..
Thirty-year-old Begin Bright owner Tina Tower was ecstatic after winning the Young Business Woman of the Year. She thanked the many women who have paved the way for people like her to fulfill their dreams and her patient husband. Her insights for franchisors called fill a book! 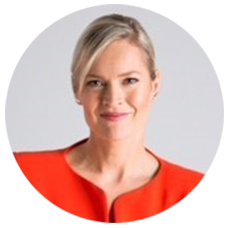 My full interview with this honest, smart mum can be found by tapping or clicking here. Coming up on the blog, all the state winners share their best business tips. 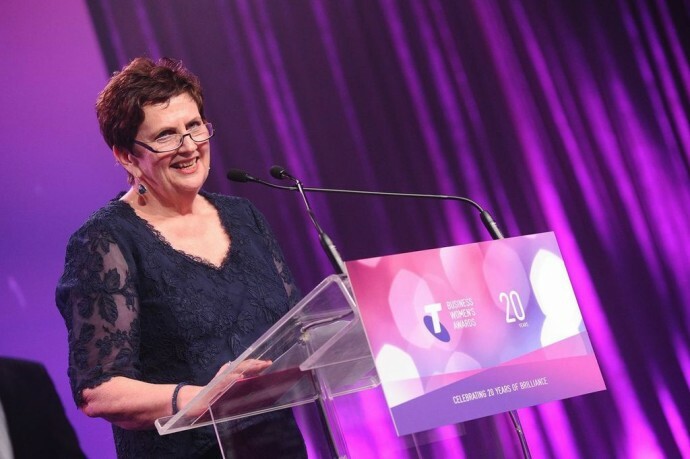 Tagged in Telstra Business Women's Awards.